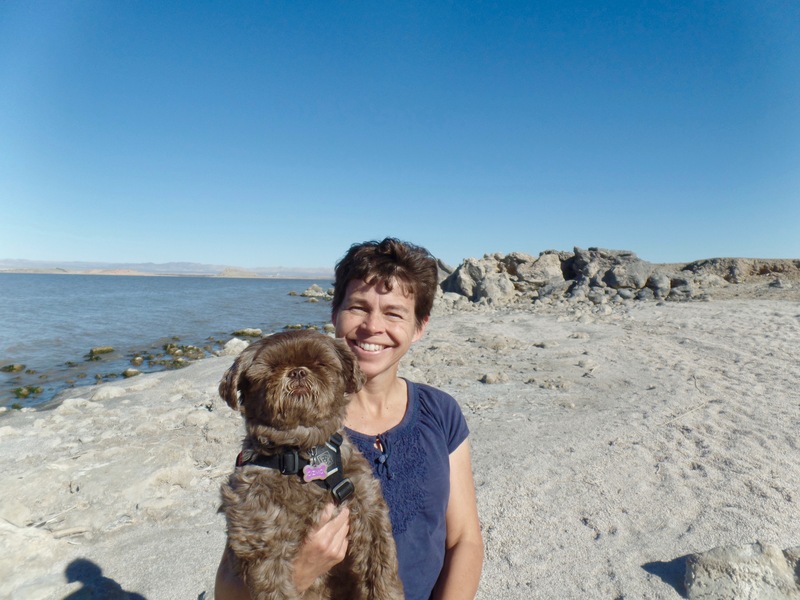 This week we ventured out to the Salton Sea. I really knew nothing about this area until we arrived in California so we did some online reading to learn more about it before visiting. 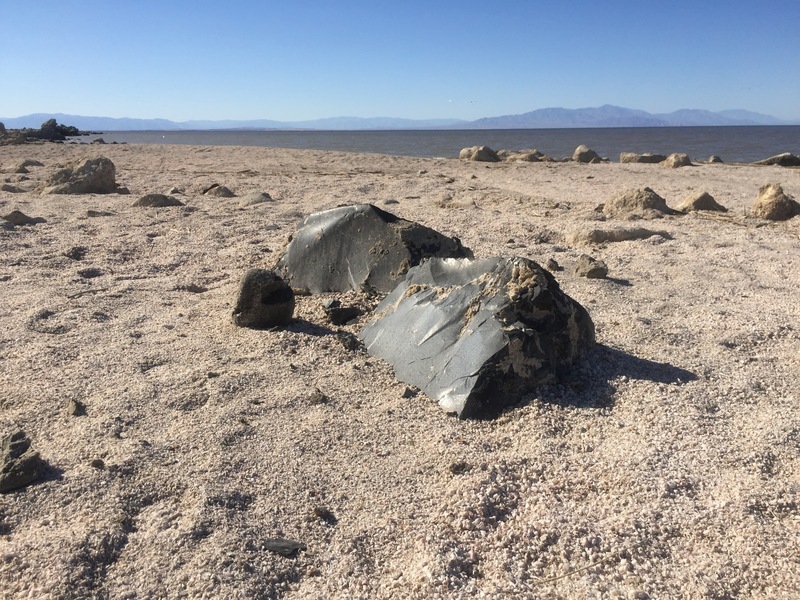 The Salton Sea region was part of the Gulf of California until about 4.4 million years ago. The Colorado River silt eventually blocked off the gulf and separated the region from the Pacific Ocean. Over the centuries at least 5 lakes occupied the basin where the current Salton Sea lies.The Salton Sea was created between 1905 and 1907 when the Colorado River broke through diversion canals in the irrigation system in Imperial County. They call this area the “accidental sea”. They initially thought it would dry up quickly, but when it didn’t they decided to take advantage of the lake shore frontage and build resort areas. 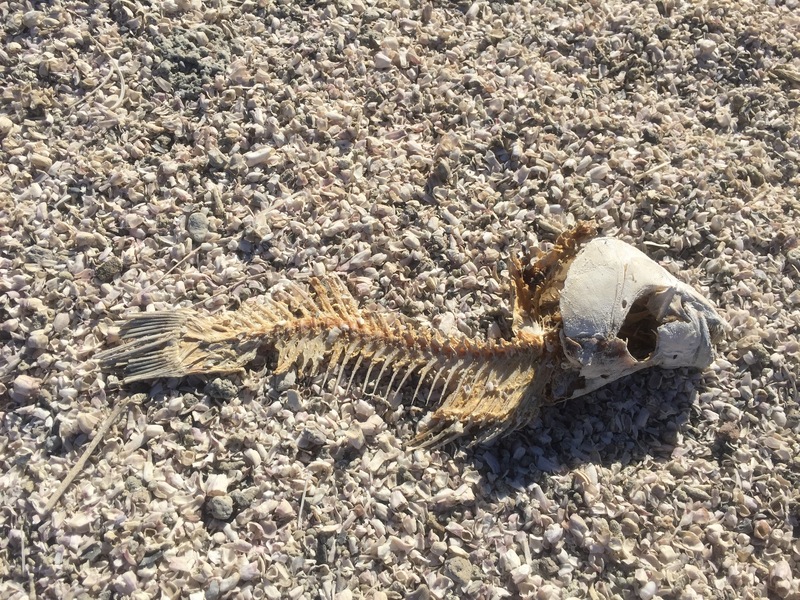 I guess this was a “happening” place to be until the sea started drying up and becoming so salty and polluted (run-off from farms, and no outlet) that the fish started dying and stinking up the place. Today the area is pretty much state lands and wildlife refuge areas. It is renowned for it’s bird watching. The Tilapia fish has adapted to the salinity and is thriving in the sea. There are tons of white and brown pelicans. We spent half the day riding the shore of the sea and taking in the sites. It is huge at nearly 35 miles long. We didn’t take in much hiking, because like national parks, California state parks are not very dog friendly. The main visitors center was great and allowed Gizmo in. We were given tons of information about the area as well as some dog friendly hikes near us. We drove out to Obsidian Butte and got a chance to walk along the “beach”. 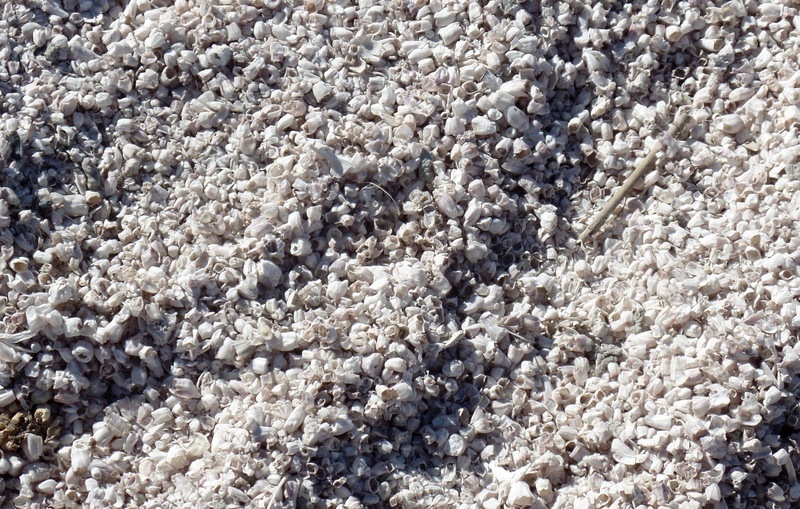 The beach looks like sand but on closer inspection you can see it’s bones and barnacles and gills. A short walk on the beach revealed the remains of many fish that had washed up on the shore. This would not be a good place to take a dog hiking! 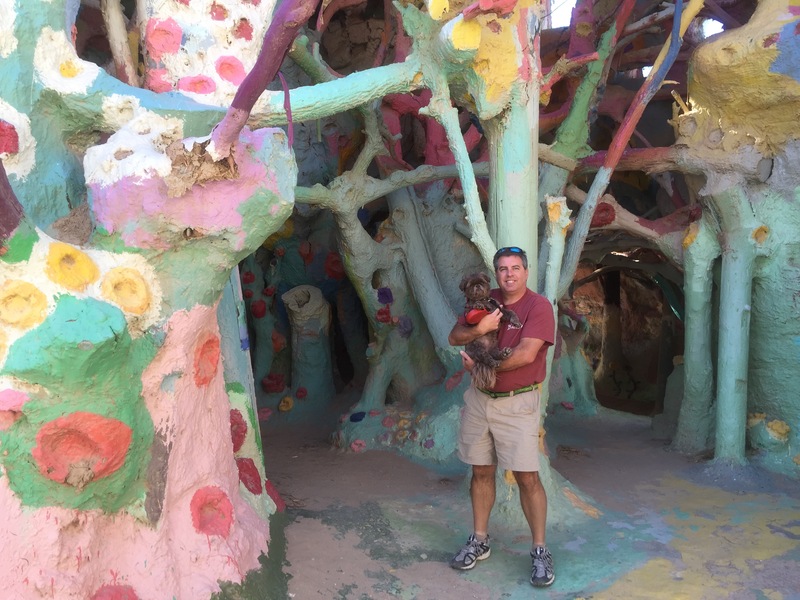 While we were in this area we decided to go see Salvation Mountain. The mountain was built by Leonard Knight, who was originally from Vermont. He built the mountain from local adobe clay and painted it with donated paint from snow birders. The mountain was his way of spreading his word, “God is Love”. Leonard died in 2014 and caretakers are caring for the mountain and trying to keep it preserved. This was definitely worth the short ride out to take in this site. We followed the sign at the base of the mountain and took the “yellow brick road” to the top for a view of the surrounding area. This attraction was busier than the Salton Sea. There were probably well over 20 people here during our visit. Kids loved climbing all over the mountain. 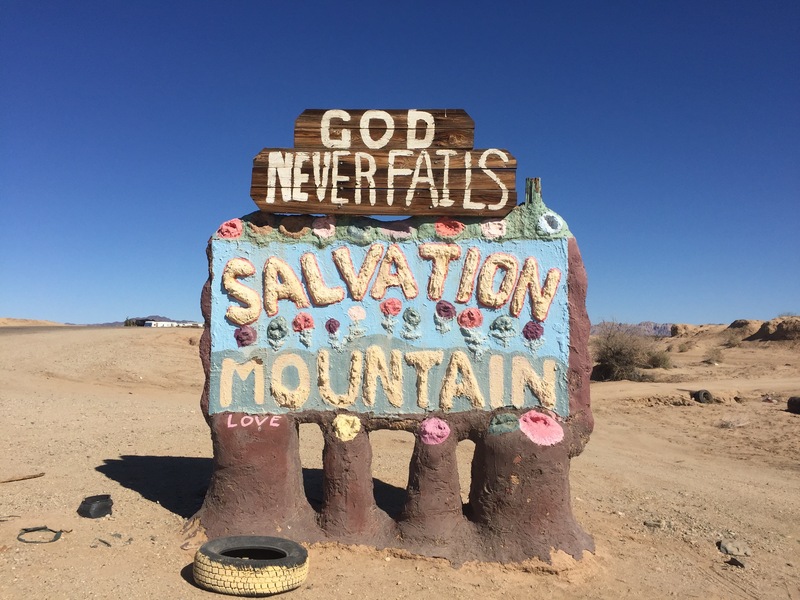 We decided not to continue on the road to “slab city” and to “east jesus”. Slab city is the remains of a marine base that has become a hot spot for snow birders who want to dry camp during the winter months. East Jesus is a dry camping spot where artists use others “trash” to make art. We had hoped to take in the International Banana Museum (guiness book record holder) but it is only open Thursday- Monday. We have decided to make a day of it this weekend and take in this attraction along with a tour of the Oasis date farm. I am really looking forward to learning more about dates since the date palm trees are everywhere here. Oooh mom, what is that smell? 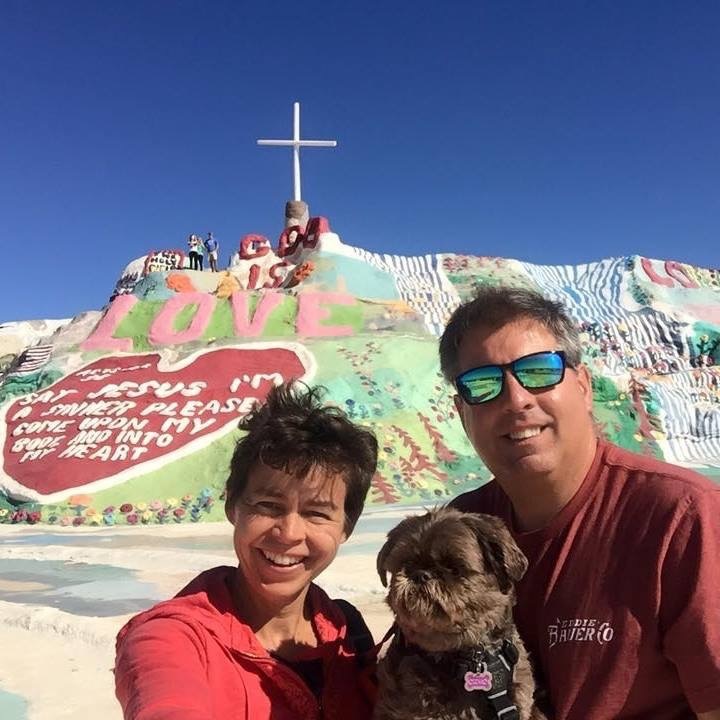 This entry was posted in Sightseeing and tagged International Banana Museum, Salton Sea, Salvation Mountain. Bookmark the permalink. We travel with our dogs too. I sure wish more National parks had hikes where we could take our dogs, but I guess we can understand that they want to keep it pristine. Enjoyed your post again.